Poipu Bed & Breakfast - Discover Hawaii in a Whole New Way! Sign up for Specials & Other Cool Stuff! There are many reasons for the Garden Island’s popularity, not the least of which are Waimea Canyon and the NaPali Coast. Waimea Canyon: Often called “the Grand Canyon of the Pacific,” Kauai’s Waimea Canyon is 10 miles long, 1 mile wide, and over 3,500 feet deep. 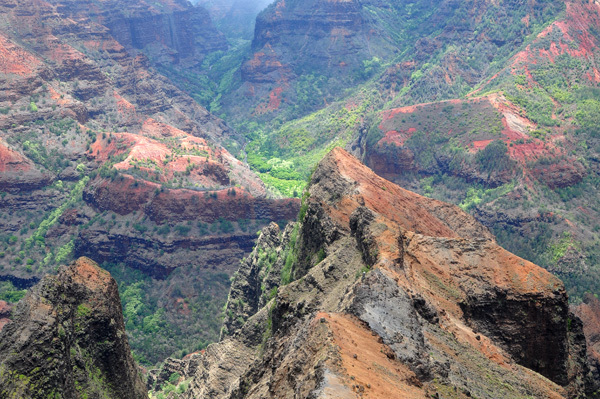 Unlike many of Kauai’s stunning landscapes, Waimea Canyon is very easy to access—in fact, it’s one of very few such places on Kauai that can be seen via a paved road. Of course, there are many miles of hiking trails available for those who wish to experience the canyon on a more personal basis. NaPali Coast: Not quite so easy to view as Waimea Canyon, but equally spectacular, is Kauai’s NaPali Coast. There are many ways to experience the NaPali Coast, but none involve an automobile, since the highway basically begins and ends here. For the truly adventurous (and experienced), a 16 mile kayak trip can be accomplished in anywhere from 1 to 3 days. However, in addition to incredible stamina, this requires some planning. If you plan to undertake a 2 or 3 day trip, camping permits will be required, and these often must be reserved up to 6 months ahead of time. So if you do plan to kayak the NaPali Coast, it’s best to know what you’re getting yourself into, and start planning well in advance. Of course there are other ways to see the NaPali Coast that don’t require anywhere near the planning or athleticism that kayaking do. Helicopter tours offer one of the best ways to see all of Kauai, including places that are all but inaccessible any other way. Hiking the famous 11-mile Kalalau Trail is an up-close and personal way to get to know this breathtaking landscape, but this too requires camping and the associated permits. Finally, many boat tours are offered, usually lasting around 4 hours, weather permitting.